You are here: HomenextBuildingsnextShopsnextW. J. Cottis - Diploma 1909. I was contacted by a lady who had recently bought a very old embroidery that was attached to a backing card. Upon removing the embroidery, she discovered that the card was a Diploma awarded to W. J. Cottis in 1909. After a search, she thought this may be connected to Laindon and offered to send me the Diploma for the Archive. I happily accepted. A little research has shown that W. J. Cottis was the originator of the shop in Billericay. His son J. G. Cottis ran the shop in Laindon. Unfortunately, despite the careful wrapping and the ‘fragile’ sticker, when the package arrived, it appeared to have been bent. Upon opening, it was apparent that the card had been snapped into four pieces. My husband Colin repaired it as best he could and then took a photo of it. He then did a repair on the photo and enhanced it. The result is pretty good. I publish below the photo before and after the repair. 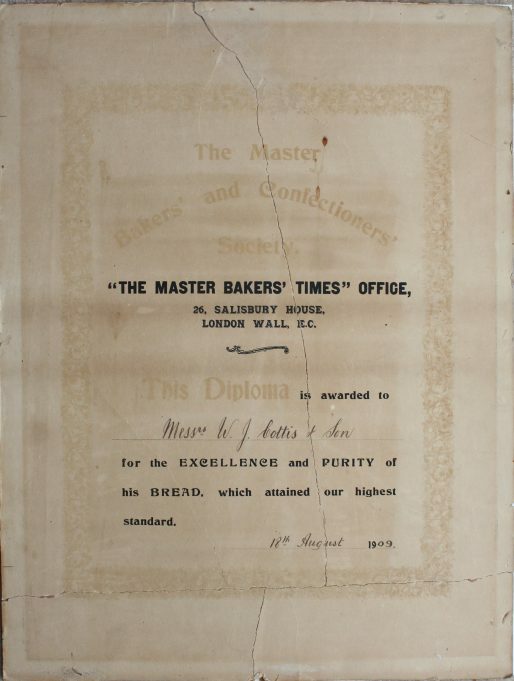 Although some of the writing on the Diploma is quite faint, it is readable and I hope both Billericay and Laindon Archive will enjoy seeing this 110 year old document that was deservedly awarded to this very successful and appreciated bakery. The diploma showing the damage done in transit. The Diploma after the repair. Laindon Chamber of Commerce Meeting. Spire's Supply Stores 10-12 Laindon High Road.